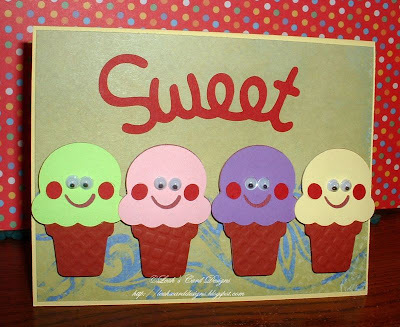 How much sweeter can it get with an ice cream card. I know ~ in the middle of winter!!! What are you thinking??? That thought just cracked me up. I don't know what I was thinking. I was making bug cards earlier then this idea hit me and I just had to make it. I hunted all through my craft office for these wiggle eyes. I finally found them and thought how cute the cones could be. I embossed the cones with my Fiscars Texture plate. I really like how they turned out. Thank you for stopping by for a look.